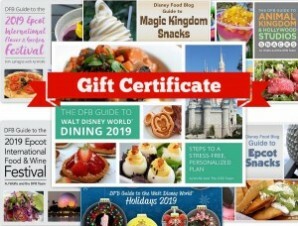 Get the DFB Guide to Walt Disney World Dining, The Food & Wine Guide, All three DFB Snack Guides, our Holiday Guide, and Dining Adventures for over 40% off! The best part? You can either print out an actual gift certificate to wrap and give directly, or you can send an email with the redemption information. No muss, no fuss! An over $103.00 value, all for $59.95, over 40% off! This offer is limited, so pick up your gift certificate today!